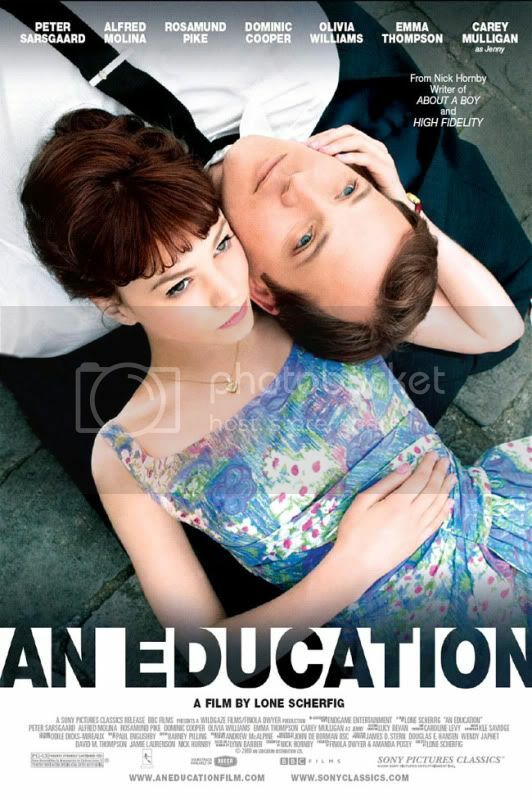 In many ways An Education’s heroine, Jenny (Carey Mulligan), reminds me of a more mature Juno [review here]. But this is Great Britain in the early 1960’s, and it is not boredom that might lead to “being in the family way.” There is a rebelliousness about Jenny, but a clever and intelligent rebelliousness. Perhaps she should have run off with Rebel Without a Cause’s James Dean or The Wild One’s Marlon Brando. But again, this is Great Britain, so perhaps she would be more suited for À bout de souffle’s Jean-Paul Belmondo, a rebel whose greatest attribute is being French. Jenny is a complicated character. Her father wishes for her an Oxford education so that she can be successful in life. Her teachers wish her the same, so that she will be a liberated, self-sufficient woman. But she wants to study English and play her cello, listen to classical music and French swooners, peruse art collections and enjoy jazz clubs. There is a world of enjoyment that she desires to experience, but even attaining this might not grant her the titular education. One day she meets a handsome young man who understands music and offers her a lift in the rain. His name is David (Peter Sarsgaard) and as their relationship grows Jenny realizes that there is another life she can pursue, away from the prudery and dullness of her parents and teachers. 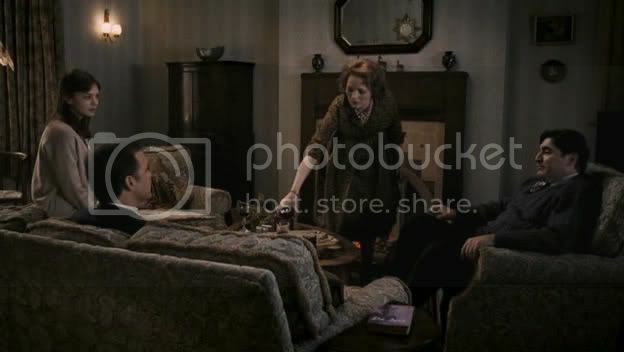 As a bonus, David is able to greatly influence her father (Alfred Molina) and flatter her mother (Cara Seymour), granting Jenny permission to accompany him on a variety of excursions. Away from her parents and her school Jenny has the opportunity to have fun and enjoy life, accompanied by David’s business partner (Dominic Cooper) and his girlfriend (Rosamund Pike). But this is not a fairy tale wherein a young rebel leaves kith and kin to partake in the debauchery of a bacchanal existence. As in real life, there are serious consequences for one’s actions, and this, perhaps, is just a part of Jenny’s education. Jenny’s story takes some serious turns, but the film handles them delicately and properly. One of the film’s strongest elements is that the supporting cast has depth; Jenny’s father is not merely an uptight prude, as it becomes clear that he has enjoyed life before marriage and Jenny’s birth. Likewise, her mother states that they had a life of fun before Jenny came along. Molina is particularly effective, and an important monologue late in the film becomes solely his. Mulligan, too, is impressive. She looks like a cute, normal schoolgirl of sixteen, but when dolled up could easily pass for the daughter of Audrey Tautou and Audrey Hepburn. As the film progresses she becomes a great deal wiser as a result of her education, and convincingly looks older. Sarsgaard, too, is great simultaneously as an awkwardly creepy older gentleman and a sympathetic romantic soul. A brief appearance by Sally Hawkins shows that she has range beyond her Happy-Go-Lucky alter ego, and Olivia Williams (Mrs. Darling from Peter Pan [review here]) has trouble not being beautiful as Jenny’s austere teacher. As a whole the cast effectively helps tell the story, blending into the background quite nicely. The production is impressive, but has a couple of serious problems. The main flaws with An Education could both have been avoided. Some of the editing is a little choppy (but not choppy enough to be a pastiche of À bout de souffle), particularly in a scene involving Jenny talking with a couple of her school chums. Such faults are easy to correct, though they may be time-consuming, and it is disappointing to see them in an otherwise stand-out production. Another problem lies with the ending. It is a fitting conclusion to the story, but the film does not take time to show the steps involved in Jenny’s ultimate education. A quick montage that whitewashes over the difficulty involved does a disservice to how the rest of the film carefully portrays Jenny’s various situations. Regardless, I enjoyed the film and found it to contain an interesting story and characters with depth. Truth be told, I have been vacillating over how many stars to award An Education. I was impressed with how it maturely deals with some difficult topics, but some construction and production flaws barely keep it from receiving three-and-a-half stars. This entry was posted in 2 pirate flags, 3 stars, E, Movie Reviews, Pirate Flag Rating, Star Rating on March 4, 2010 by Tim Irwin. Yep. You pretty much hit everything I loved about it. I was especially impressed with Alfred Molina’s performance, and was pretty disappointed he didn’t get nominated for Best Supporting Actor. As for Carey Mulligan, she’s becoming one of my new favorites. Also, I was happy to see how well they pulled off the period. One of my favorite lines was when Jenny is telling Emma Thompson that she doesn’t want to care about school if she’s only going to be a boring schoolteacher, and Emma says “It doesn’t have to be teaching. There’s always the civil service.” I thought the film made several of those subtle historically-accurate sort of nods to the era. I probably didn’t get all of the small period details, but I was curious about David giving her a lift at the beginning. Was it treated so delicately so that today’s modern viewer would not be inordinately creeped out, or because that’s what life was like at the time? I almost wondered if British folks in 1961 were as innocent as American movies would have you believe America was at the same time.